Spokane 1974 World’s Fair, Celebrating Tomorrow’s Fresh New Environment, United States Pavilion, 2007. Vladimir Belogolovsky: The English photographer David Bailey said, “it takes a lot of imagination to be a good photographer. You need less imagination to be a painter because you can invent things. But in photography everything is so ordinary; it takes a lot of looking before you learn to see the extraordinary.” Would you agree? Jade Doskow: Definitely. I think the intrigue of photography is that you have to work with the unpredictable parts of the world around you, the whole notion that “the truth is stranger than ction”. If you are looking carefully enough you can reassemble these slices of reality into a new reality, that of yours as the seer. These considerations can completely change the meaning of so-called reality. I should also add that I spent many years training as a classical pianist, and I see the act of creating photographs as a similar art practice. When performing the notes of a composer from hundreds of years ago, this long-ago era is once again brought to life, activated, 115 by the performance. I see the photography of old architecture as a similar relationship, re-activating these buildings—notes that exist around me via the apparatus of my camera—in this case, a large-format 4×5" camera, not dissimilar to the equipment used at early world’s fairs. The camera has become my instrument. Seattle 1962 World’s Fair, The Century 21 Exposition, Universal Fountain, 2007. San Antonio 1968 World’s Fair, The Confluence of Civilizations in the Americas, Monorail Fountain, 2013. VB: Your photographs of decaying architecture bring the past into the present. they convey people’s dreams through fantastic structures and the fall of those dreams. What is it that you try to achieve in working on your images? JD: I look for a certain complexity. I try to weave together a sense of time passing to echo the idea that many of the structures were built as futuristic, but now we are looking at them as something retro. I also employ longer-than-normal exposure times to capture smears of movement, such as branches blowing or water owing, the world in motion around these silent and still structures. VB: You could be interested in decaying structures, such as abandoned barns or military bases, but you are speci cally fascinated with documenting the sites and remnants of world’s fairs. Why? JD: It’s because of the utopian and dystopian characters of these sites; because old buildings falling apart are not just old buildings falling apart. There is so much vision that was put into these daring structures. For example, Buckminster Fuller’s geodesic dome in Montreal epitomized futuristic and sustainable living, or the Eiffel Tower and the Seattle Space Needle represented great symbols of national pride. Imagine, all these top architects and designers came together to create absolutely fascinating mini cities, as well as spending millions of dollars on materials and labor, but so often there was a complete lack of planning and vision as to what to do with these places after the fairs closed. They often stayed completely abandoned—or, ultimately, demolished, as many abandoned pavilions were in San Antonio from 1968. There is so much fantasy that goes into creating these structures, but afterwards they are often lost to neglect, arson or demolishment. They are also repurposed into museums, monuments and fountains, housing, restaurants, tourist attractions, racetracks, zoos and city parks. Some structures were originally built as temporary, but they were so popular that they would be rebuilt permanently after the fairs, as was the case with the full-scale replica of the Parthenon in Nashville, Tennessee, now used as an art museum. Fragments of neoclassical complexes in San Francisco and Chicago also became museums of ne arts. And in Montreal they host electronic music festivals around the huge Alexander Calder stabile Man and his World at the grounds of the 1967 fair. Montreal 1967 World’s Fair, Man and His World, Buckminster Fuller’s Geodesic Dome with Solar Experimental House, 2012. Vancouver 1986 World’s Fair, World Exposition on Transportation and Communication, Science Center/Expo Center ’86, 2014. VB: Now that your first book on this subject is complete, do you have a favorite photograph? and would it be because of the resulting image or circumstances under which you worked on nding that particular viewpoint? JD: This book is the first time that many of these images are collected together relating to one another, and it has been intriguing and exciting to see elements brought out in relief due to their new relationship with the preceding and following images. Through the writings of Richard Pare and Jennifer Minner I can appreciate new ideas in the images that I had not previously fully realized. A few images have long been preferences of mine, such as the Seattle Center Arches at Night. In the background of the image is Minoru Yamasaki’s future facade for New York’s World Trade Center; having witnessed this tragedy, this image is, for me, a memento mori to New York. The nal image in the book, the abstraction in blue and yellow from the Chicago site, is also a continued favorite of mine as it is so completely mysterious—it almost possesses a mythical quality. Brussels 1958 World’s Fair, A World View: New Humanism, Atomium, 2007. Architectural and landscape photographer Jade Doskow is known for her rigorously composed and eerily poetic images that examine the intersection of people, nature, and time. She is on the photography faculty of the School of Visual Arts and International Center of Photography. 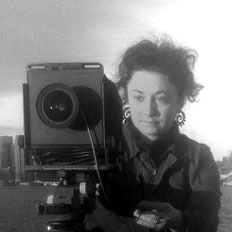 Doskow is currently working with the award-winning filmmaker Philip Shane on a documentary about her World's Fair project, due for completion in late 2017. Her monograph of the Lost Utopias project was released by Black Dog London in December 2016, and was listed by American Photo as one of the top photo books of 2016.